How long does it take to find an answer? This week's challenge ("Who IS that woman?") wasn't especially tough. It was interesting, but not particularly hard to do. But there are some people who will disagree with me, and therein lies a great tale. Roughly 12,000 people read the challenge, and if you look at the 150+ comments I got on this, it seemed to capture many readers interest. 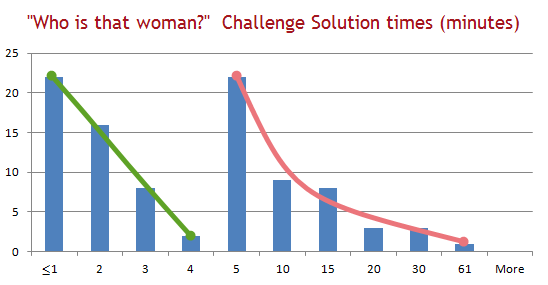 People who solved the problem reported time-to-solution ranging from 5 seconds to 60 minutes. I went through all the comments (and personal emails) to collect 94 reported times. Here's the chart of how long people said they took to find the answer. The other way to look at this is that 50% of those-who-solved-it took 5 minutes or MORE (that's the red part of the histogram). This kind of pair of curves is fairly common in my research. There's a group that gets to the problem solution fairly quickly, and another group who take longer... 50% took less than 5 minutes, while 50% took more than 5 minutes. Another interesting fact is that 14 people in this sample took more than 10 minutes to find the answer. 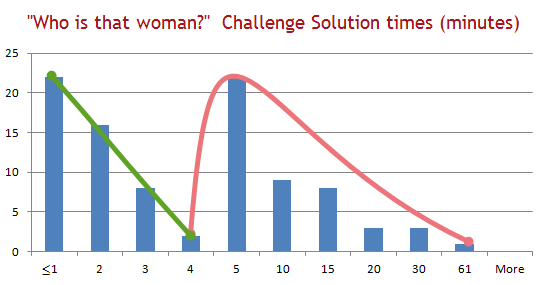 The average time-to-solution was 6.4 minutes, which is, all things considered, fairly long. (1) Insider knowledge: In a sample like this you always have people who just know the answer or have some kind of "insider knowledge." In the comments I found geologists and mining engineers who actually read the book in school. Another person lived near the Hoover house and had picked up a lot of local knowledge by circumstance. People with inside knowledge can often make a query that jumps right to the answer. These are people who did queries like [ Hoover Latin text ]. *I* certainly wasn't in that group. Maybe you were. But for almost any search challenge I pose, there are people with some info that makes them very fast. (2) Fast searchers: And then there are the "fast searchers," people who picked out the most unique terms in the problem that let them get quickly to the answer. These folks look for very "individualistic" terms (such as [ female mining engineer Stanford ] ) and manage to scan the results rapidly to find the best candidate solution. The best searchers then double-check that candidate to see if there's a second (or third) source that confirms the insight. (3) Slower searchers: To be sure, some of the searchers who took between 5 and 10 minutes just got sidetracked by the material. Kudos to them for being curious! But I also know that 16% of the people who answered took more than 10 minutes to answer the question. The question that interests me is "Why did the slower searchers take so long?" In some cases, it was a problem of making incorrect assumptions. Paradoxically, this often happens to people who are experts in the field. They say things to themselves like "this can't have been a 15th century text, it must have been a 17th century text... let me start there..."
Search Lesson: Even (especially!) if you're an expert in a field, do the simple, dumb, obvious search first. Don't dive too deeply into the content without first checking out the obvious and straightforward. I know this seems counterintuitive, but it's true. (I really know this because it happens to me all the time...) Check the basic queries first, THEN dive down. As I wrote in an earlier blogpost, Don't miss the forest for the trees. The short answer: Lou Henry Hoover, who with her husband, Herbert, translated De re metallica (Latin for “On the Nature of Metals” (or minerals more generally)). For this, Lou and Herbert won the Mining and Metallurgical Society of America first Gold Medal for Distinguished Service (1914). How to find it: As several readers pointed out, the simplest search to solve this Challenge is [Stanford woman mining engineer] – if you think about it, there just can’t be that many such people ever in the history of Stanford. And, with that query, you’re quickly led to Lou Henry Hoover (her Wikipedia article is the second hit), and once you read that entry, all the answer is there before you. 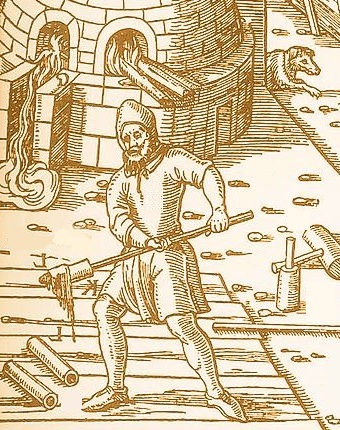 Search lesson: When you have very distinctive information (female mining engineer, Stanford) or (published 16th century Latin mining manuscript), use those as your initial key words. You’ll get into the the answer space very quickly. Now, about Lou Henry Hoover: Here's a bit of background I can’t resist, she’s such an interesting person. As First Lady, Lou Henry Hoover invited all Congressmen's wives to visit the White House including Jessie DePriest -- the black wife of the nation's one black Congressman, Oscar DePriest. In a time when the Ku Klux Klan held genuine political power, this was called "an arrogant insult to the nation” and was an act of real courage. Wednesday Search Challenge (12/28/11): Who IS that woman? Every so often you read about someone who is so interesting and so unexpected that you have to find out more. I spent a happy few hours this week reading about a woman who fit this this description. She was, in many ways, a woman out of time—even though born in the 19th century, I have a feeling she'd be very comfortable living today. There's much more to say about this woman, but if I tell you too much more, it'll be a piece of cake to figure out who she is. But I will tell you one other clue: she was introduced to her future husband by the famous geologist Dr. Branner while they were still in school. They married and had a pretty amazing life together. Again, if you can, please let me know HOW long it took you to find the answer, and if you can, WHAT process you went through to find out! Thursday, April 19--same as the day before, unseasonably warm and clear, but windy. No temperature data. Friday, April 20--the usual northwesterly winds returned, cooling off the city and returning to normal San Francisco weather. No temperature data. Sunday, April 22-- warm; high: high of 72F, no low temperature data. While some of our readers found this pretty straightforward, I actually spent around 2 hours trying to get the answer. This was difficult for many reasons. First, it's San Francisco--land of many micro-climates (the weather can vary 20 degrees F across the city; it can be raining in the western part of the city, but sunny in the eastern. Second, because of the disaster, local newspapers stopped publishing and the weather stations in San Francisco were destroyed. (And, as noted, with such wildly varying microclimates, you can't just extrapolate the weather nearby, in Oakland for example, to what was going on in San Francisco.) Third, there was general chaos in the city, and noting down the weather was not first among the priorities when there were so many homeless and the city was burning. This all made for a great search challenge as it quickly became clear that the normal tricks-of-the-trade (such as reading archival newspapers) wasn't going to work as easily. I began my search with the obvious [ San Francisco weather 1906 ] and ended up reading lots of commentary that told me about April 18th and 19th. 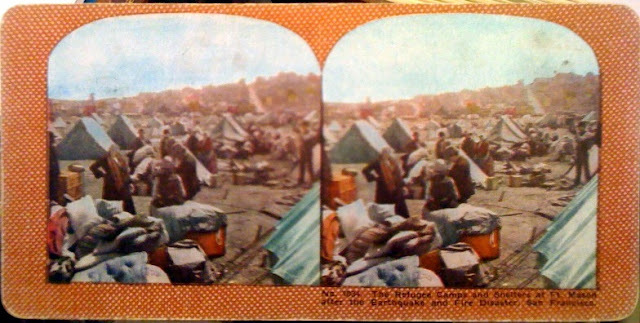 Those days were unusually warm and clear, which meant that the immediate aftermath for the survivors wasn't miserable, their town might be burning down, but people could camp in Golden Gate Park without the cold and misery of fog. But getting the next couple of days data was harder. “The temperatures were ideal for a conflagration. On the second day the thermometer jumped a dozen degress to an unseasonable high of eighty-one, as measure in Berkeley and Oakland, since San Francisco no longer had a functioning weather bureau. Friday was also unseasonably hot. That tells us the weather from April 18-21. What about the rest of the week? And would it be possible to be more precise? His records show (see the actual scans of his log books for April 1906). This is a fascinating document as it's the official temps and precipitation. You can find the official compilation of all this data by searching for [California "climatological" data 1906] which leads you to Climatological Data California (compiled by the California State Agricultural Society). Search Lessons: A big takeaway from this challenge has been how much data can be found in online Books. Finding the Climatological data book was a surprise, although I ended up there because I saw a reference to it somewhere in my reading. I jotted down a note, and then searched for [California "climatological" data 1906] (the word is in quotes to prevent synonyms from being search--I knew this was in the title of the book). Additional reading: There's really a huge amount of stuff out there about the earthquake and fire. Many of the stories are tragic, some heroic, and some are just unbelievable. (Some authors believe that the majority of damage to the city was caused by ill-advised attempts to create firebreaks by dynamiting barriers. This worked, except when they blew up a distillery, which caused massive explosions and sent firebrands all over the place.) Here are three that I found especially interesting. SF Virtual Museum articles (they have a great wealth of diary and oral histories about the disaster). but the background buildings are clearly completely destroyed. This scene is from Fort Mason, one of the major refugee sites for survivors. The Army supplied tents and a thriving mini-city lasted for months afterwards. The recent Tōhoku earthquake and resulting tsunami on Friday March 11, 2011 was devastating with massive loss of life and property, putting thousands of people out of their homes in an instant. This made me think back to the last giant disastrous earthquake that happened in San Francisco--the 1906 earthquake that destroyed the city through a combination of ground shaking and subsequent ill-planned attempts to stop the fires that were started. 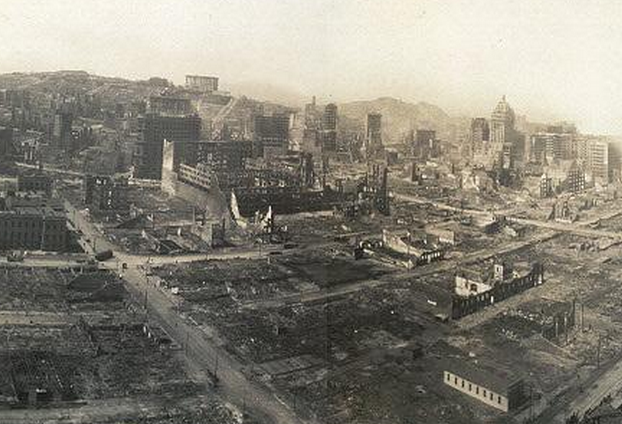 Much of the city was leveled, then much of it burned, leaving at least 250,000 people homeless. As you know, San Francisco can be a lovely place, but it can also be cold, windy and foggy. While it never really snows, it can be a very unpleasant place to be camping without supplies while the city is being restored. What was the weather like in San Francisco on the day of the 1906 earthquake AND for the next 7 days afterwards? Two views of downtown San Francisco after the earthquake and fires of 1906. What was the weather like if you were homeless after this earthquake? This gets to be slightly tricky as all of the communications infrastructure also went down with the earthquake. So, how will you find out what the weather was? Was it cold and foggy? Was it raining? How miserable was it for the survivors? Caution: When I was searching for the answer to this, I kept getting pulled into remarkable and amazing stories about the earthquake. You might too. This search took me hours longer than this should have because it was a fascinating topic. Careful that you don't spend too many hours researching this amazing time in California history. Be sure to include a quick description of HOW you found the answer, WHAT resources you used, and HOW LONG did it take you to find the answer. It was a 50 yard fog. Beyond that distance, it was all just white, a slowly swirling, pearly infinity… the kind of fog that hides everything outside of a certain distance. As I walked through Mitchell Park early that morning with my coffee in hand, I was struck by how different everything seemed. It was quieter than usual—you’d expect that in the fog---but was I was noticing was how the structure of the park, the very shape of the open fields, the arrangement of trees, the layout of space seemed somehow… different… Mysterious, sure, but in particular, the masses of trees seemed somehow more apparent, less ordinary, more.. I don’t know…present. As I crossed the small bridge over Adobe Creek I saw redwoods looming up out of the translucency. There was one, maybe 100 feet high. I walked another 30 yards and could see more redwoods emerging as I moved forward. “Redwoods” and “fog” go together about like “orange” and “juice,” they co-occur all the time. Redwoods love the fog and rely on it for moisture in their natural habitat in the mountains. But this time it was in the park near home. And for the first time I noticed something that had somehow escaped my attention on all my previous visits to the park. 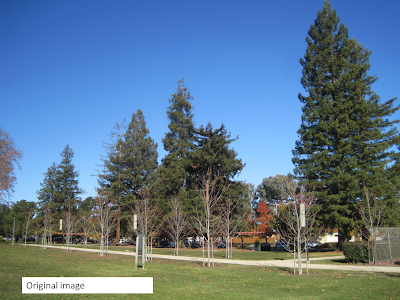 The redwoods were planted in a straight line at regular 10 yard intervals—a picket-line of tall trees. I stopped and stared—how was it possible that I’d never, ever seen this regular progression before? It’s not just trees in a line along the edge of the street, these were hundred-foot giants that were marching like Ents into battle through the fog of war. Seeing this progression of trees in my local park made me feel as though I’d somehow missed a major feature of the landscape. This wasn’t just beautiful backdrop, this was a linear forest that I’d somehow never noticed. Was it the fog changing my perception and letting me see the gestalt by eliminating visual noise from the scene? One of the fundamental principles of gestalt perception is the law of prägnanz (German for pithiness), that is, we tend to organize our experience in a manner that is regular, orderly, symmetric, and simple. In this way, things that clump together seem to be a “unit” (such as a row of trees), while items farther apart are seen as individuals. I’ll let you work out what the conditions for “togetherness” and unit perception are. Could it be that I was seeing some kind of hybrid image? You’ve probably seen these before—when you’re close to the picture your eye picks up all the high frequencies, but as you back away your eye can’t see the tiny, high frequency twiddly bits any more, just the larger strokes of the low frequencies. That’s how the same picture can look like Einstein up close, but Marilyn Monroe from far away. Is that what the fog was doing? Somehow attenuating the high frequencies? I suppose that what was happening to me is true more generally. Different circumstances cause substantially different outlooks on the world. I was thinking about literally seeing another person’s point-of-view the other day as I reviewed a paper about an “embodied avatar,” that is, the paper described an animated picture of a person (the “avatar”) that could be projected onto walls and manipulated by a real person. The article was all about how confusing it was to the person who was remotely operating the avatar—how they’d mix up left for right, or swap “near” to them vs. “near” to the avatar. That all made sense, it’s just the normal confusion people have when trying to run something that’s far away from them, when what-they-see is NOT what the remotely controlled device sees, particularly when there’s a coordinate transformation involved. I’d had some practice doing this with remotely controlled gliders. I’ve built more than a few from scratch and had the distinctly painful experience of unintentionally swapping left for right or up for down and driving my laboriously built glider into the ground at a high rate of speed. As they say in the business, I practiced “controlled descent into terrain” because I momentarily couldn’t figure out if up was down, or left was right… from the perspective of the glider. I know this kind of thing is common when you’re doing remote control. I’ve spent many happy hours projecting myself into the seat of my remotely controlled glider, slowly learning the skill of “seeing the world from the point of view of the glider” rather than seeing things from where I was actually standing. And as a careful reviewer I wanted to write a review that would help out the authors. Point them to literature that they clearly didn’t know about. So I looked and looked and looked and I finally found that literature, but it was also a painful process of discovering what the right language to use should be to discover it. I tried things like [remote control glider disorientation] and [driving at a distance] and even [drone flying practice] (hoping to tap into some Air Force research about remote operation of drones in the military. But nothing was working. Was I completely off base here? Did that literature NOT exist somehow? I began to question my own memory of reading this stuff. Aha! It wasn’t “remote” *anything* -- the term of art is teleoperation—when I read that, I had thoughts of scientists from the 1960s picking up flasks of radioactive substances, and images from my late 1960s schoolboy books of science flashed through my mind. But the prefix “tele-“ was the key that led me to the robotics literature and to the studies of disorientation because of eye location vs. remotely-operated system displacement. This kind of “noticed insight” happens often enough that it’s got to be more than just an oddity. I find it really interesting that such a tiny, barely observable artifact can drive your search to a successful completion. And it seems it’s just true more generally: Small changes in your perception can transform everything you see in an environment. That’s when I thought about what I’d seen in the park. The day after I walked through the fog I went for a run on a trail in the canyons not far from home in the Hidden Villa preserve. It’s a mixed variety forest—some fir trees, mostly oaks of different kinds, a few big tooth maples, some California buckeyes. Along the trail grows mostly ferns, some hazels, coffeeberry bush, sycamores—the typical understory of the Santa Cruz mountains along streams and rivers. (It’s called the “Central Californian riparian” ecosystem.) In the summertime the plants are pretty much a uniform green—you can see the leaf shapes, subtle variations in green, but not much else. It’s pretty much all a wash of plantlife. But now, in late autumn, the maples have been transformed to brilliant yellow and stand out like chrome yellow beacons in the background of oaky green. That’s the kind of thing you expect. What I didn’t expect were the changes to other plants visible on Hidden Villa trail. Like the maples, different kinds of shrubs had changed colors, making them visible as newly apparent groups as well. The willows had changed, the poison oak, the sycamores… between all the color changes and leaves falling, very different kinds of plant structures were visible. Now, another gestalt principle is the Law of Common Fate—birds that fly together in a flock share very similar trajectories over time and can be seen as a group. In the same way, as you run up the canyon, bushes that share a color, or are now visible because of leaves no longer in the way can be seen as sharing a common motion against the backdrop of the evergreens. And that’s when I understood what I’d seen in the fog. 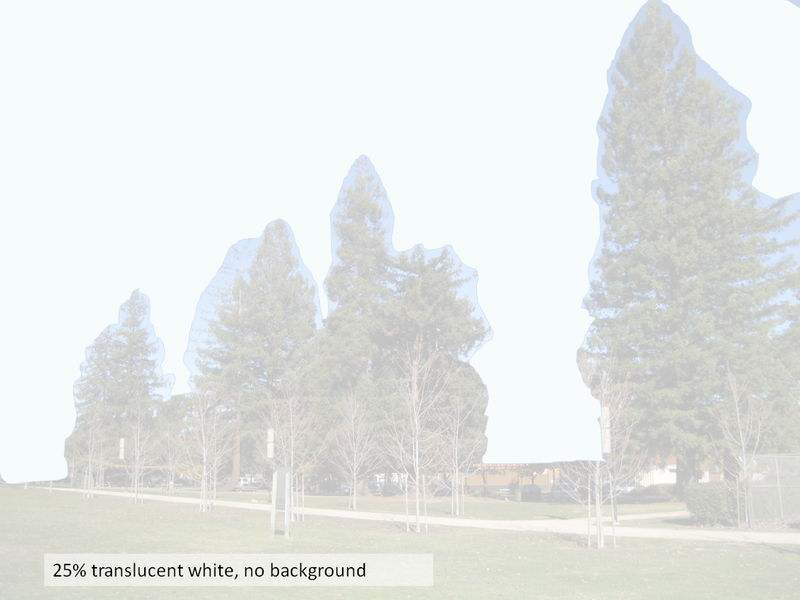 I’d initially thought that fog was just adding a white-gauze-like filter over the scene, and that THIS was what had changed my vision of the redwoods. So, being an experimental kind of guy, I went back to the park, stood at the same place where I’d suddenly seen the redwoods in a cluster and took a picture with my digital camera. Then, back at home, I played around for a bit by adding translucent layers (representing the fog) at different opacity levels. Here’s the strange result: no matter what I did, I couldn’t get the redwoods to “pop” out of the background the way I’d seen it on that foggy morning. What did I not understand? My run up the canyon with the changed foreground against the evergreen background gave me the insight I needed. To get that “pop” gestalt effect, I needed to see the redwoods as sharing a Common Fate; that is, that they’d appear to move together as a unit. But just adding in a translucent layer of white wasn’t cutting it. What I realized now during my run was that seeing a different background altered what I could see in the foreground. Not only was the fog putting a white glaze over everything, but the fog was ALSO cutting off all of the background behind the redwoods. It was a screening effect, changing what groups I could perceive by eliminating the background. When I photoshopped out the background—as though it were being done by a 50-yard fog—it became clear what was going on. The redwoods stood out as repeated units marching down the edge of the park. 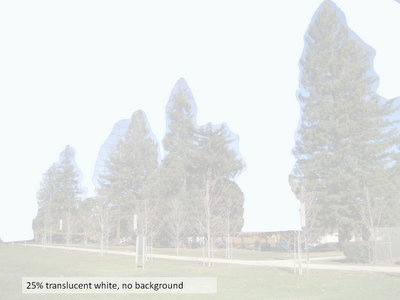 As I looked at the altered picture, I also realized that there were a line of sycamores in front of the redwoods. (They're the small, bare trees between the camera and the redwoods in the picutres.) But they’d all lost their leaves as well. If I’d walked this way on a foggy day in June, I’d have never seen the redwood gestalt—it would have been hidden behind the canopy of the sycamores. It was literally a case of not being able to see the trees for the forest. And although it's a little hard to see in a static image like this, when I was walking through the fog, it was clear that the redwoods were supposed to be planted in pairs (at either end of two horseshoe pits--for 4 pairs of redwoods). 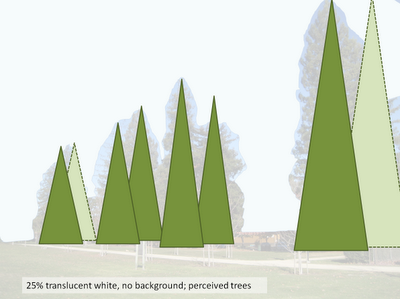 But as this diagram shows, two of the trees were missing. 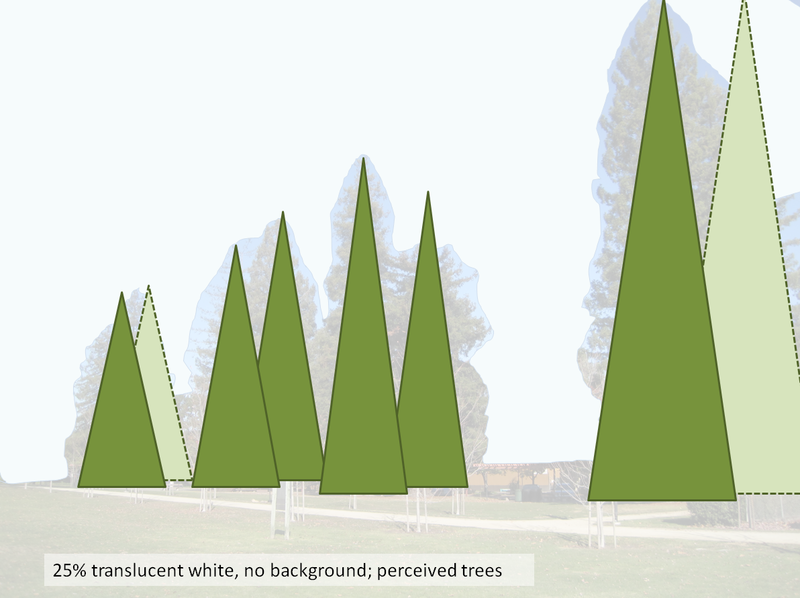 The effect was driven by the parallax shift on the two existing pairs of trees (solid lines, dark green) and was so striking that I walked over to the horseshoe pits and found, sure enough, that two of the eight trees were missing-in-action, having fallen prey to time and disease, leaving just stumps on the ground. So it turned out to be two small changes: one small change in the foreground (the leaves that had fallen, revealing new views) and a small change in perception of foreground/background made possible by the fog cutting off the background. But like running across “tele-“ in my search, my little observation ( understanding the effect of fog as creating a moving backdrop obscuring what’s behind) led to a whole new way of looking at the urban forest, and an appreciation for new ways of seeing the world. Bottom line for search: There are two big lessons here. (2) Sometimes removing the background clutter can improve your vision. In this case, the fog was giving me a background removal function for the visual image. In looking at search results, you'll sometimes have to figure out what to ignore to let the big picture stand out clearly. Answer: Where is that trail? 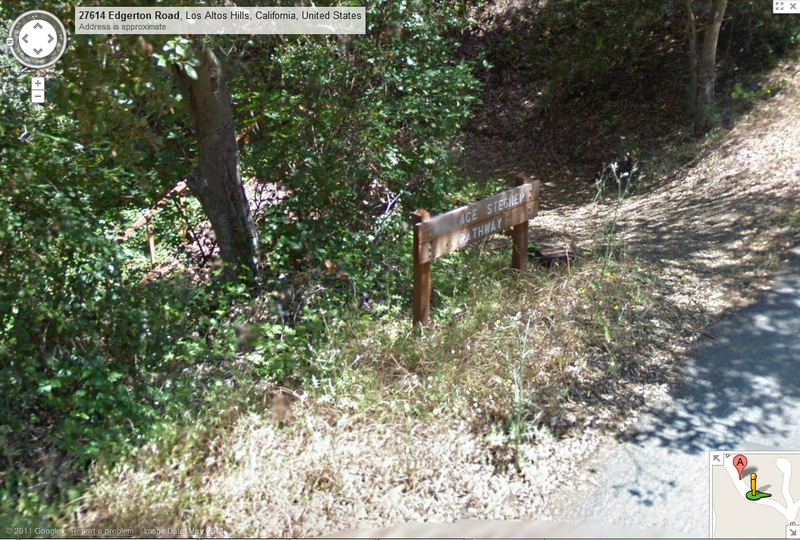 Quick answer: One end of the trail is here, near 13456 S Fork Ln, Los Altos, CA 94022 (or, lat/long: 37.376390, -122.16103). And after reading through some of your comments, I was able to find the other end of the trail on Edgerton Rd. I kept thinking it was a "trail" so I kept searching for a trail map that had "Wallace Stegner trail" on it. That turned out to be a bit of a dead end. 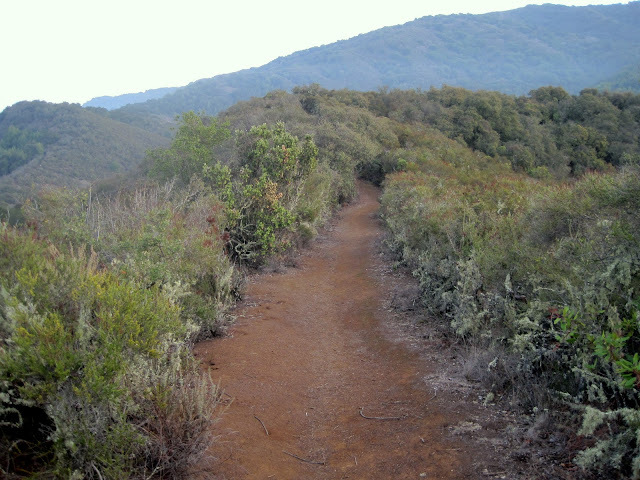 It's partly because Los Altos Hills calls their system of trails "pathways" rather than trails. I picked up that useful factoid by reading about Los Altos Hills trails and stumbling across an article that mentioned their "system of pathways." Once I did a search for [ "Wallace Stegner pathway"] and it returned only 5 hits (and one of which is broken with a 404 error). Luckily, the link to SF Gate article about Wallace Stegner's house being demolished was good enough. "It [the trail] starts on Three Forks Lane where the narrow path alongside Matadero Creek near the Stegner property. " If you look at the Google map for that street address, you can see that the obvious nearby watershed is named "Matadero Creek." And if you use Google Streetview to "walk" down the street to the place where the creek crosses the road, you'll quickly find that location, here. Now, to tell the truth, even though I was THERE, because of the complications of the hills where I'd been running, I really didn't know where the official start of the trail was. So this result surprised me. Now, my next task... to find the other end. "...Wallace Stegner Path from Three Forks Lane to Edgerton Road, named for the world famous author who lived for many years just uphill from that path." It wasn't hard to use StreetView to find the other end on Edgerton Rd. this sign is a license plate. To be sure, I tried following the trail on the Maps view, and I even tried Google Earth, hoping to get better resolution. But the trail is obscured by heavy trees, and I couldn't follow it reliably. Luckily, the city put up those handy markers to let me find it! Now... 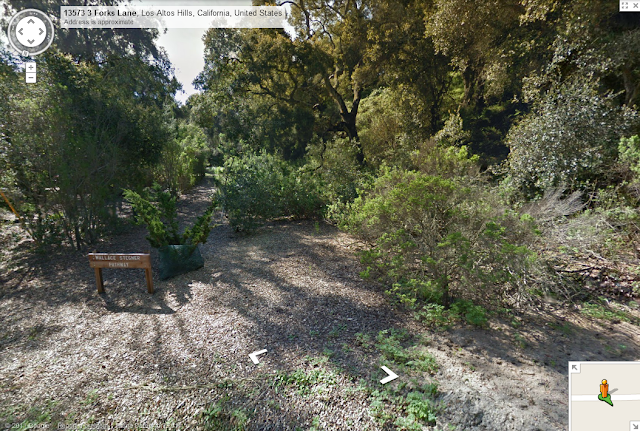 I have to point out that many readers found the Wallace Stegner Memorial Bench located up in the Long Ridge Open Space Preserve at lat/long: 37.278778, -122.160767 It turns out that I've gone running up there too, and it's NOT on the Wallace Stegner trail (or pathway), and it's definitely NOT in Los Altos Hills (as I said in the original challenge). It's actually on Long Ridge Road (a fire road / trail). It's a beautiful place too... and for some very nice photos of the Stegner Bench, see SmugMug photos. But I congratulate you on finding a truly wonderful place to go for a hike that perfectly captures the sense of Stegner's writing. If you're in the area, I highly recommend a visit--both to the bench and to the trail. Search lesson: (1) Check your work. (It wasn't in Los Altos Hills!) And (2) when you're reading through related texts, be sure to stay alert to the possibility that what you're searching for might be called something else. That is, your terminology might not quite be the right one. Stay open to other ways of saying things. Wednesday Search Challenge (Dec 14, 2011): Find that trail! I may as well admit it: I'm a runner, and I love to run on the trails in the Santa Cruz mountains near home. It's one of the great reasons to live near the Googleplex--there are wonderful hills to run not very far away. Here's one not so far from home. Last week I was running near here on a hilly trail just west of Mountain View in the city of Los Altos Hills. They have a wonderful set of trails that wind all over the place, up hill, down dale, and all over hither and yon. Sometimes I'll go running and just see where I end up. It only takes a turn or two before I can find a new trail. That's what I did this past weekend--I started running and made a few random turns, ending up on a trail that I'd never seen before! What I *did* find was a sign-post that said "Wallace Stegner." Aha! I was on a trail named for the great writer of the American West! I turned around, and ran back the way I'd come, and an hour later was back home trying to find the start of that trail on a map. It took me a while, but eventually I was able to find it. When you post your answer in the comments, be sure to say HOW you found it and HOW LONG you took to find it! Answer: Who was she, and how much did she get? The questions were: Who was the developer who lost Twain’s investment… Who was the woman who sued him… and ultimately, how much did the developer pay to her to resolve the accusations? The short answers: Mark Twain invested overmuch in the charismatic developer / inventor James W. Paige’s typesetting invention and lost all of his investment. Paige, a fascinating scoundrel if there ever was one, became engaged (maybe) to Jessie Hall, who later sued him for $950,000, which is a lot now and an incredible sum back in 1892. But the story is so complex that the lawyers eventually signed a statement that discharged the suit with no money changing hands. That led me to learn about the Paige typesetter. 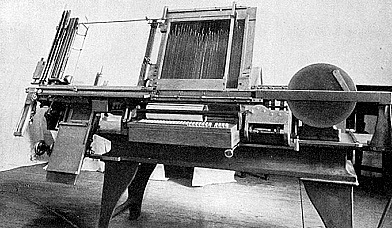 As noted on Twain's Wikipedia page, "His technological fascination with the Paige typesetter has often been cited as the ill-fated investment that bankrupted him." Okay, this is the probably the issue we want to focus on. So, I searched on [Paige Typesetter invention] and that leads straight to the Twain Quotes Page, a page rich with content, really interesting pull quotes from a number of contemporary resources about Paige, covering all of his foibles and various pecadillos. Now... one of the operating principles you have to take on as you do internet research is to check everything. So I started checking things. The big search point is that newspaper archives are often a great way to follow up these kinds of trails. BUT they often need to be searched newspaper-by-newspaper, which often brings up the problem about finding archives of newspapers that might be out-of-print. You usually need to search for the newspaper, THEN find an online database that has that newspaper.. for the dates that you’re interested in. In this case I started with the LATimes.com because I knew that they had searchable archives (through Proquest). I did that search, found the article, and then used that to spot check the other articles (e.g., the Hartford Courant). Of course, the NYTimes has a free archive, and a quick search on their archive [ "Jessie Hall" James W. Paige ] (in 1892) leads to a nice article in the New York Times. Notice that I used double-quote around "Jessie Hall" to avoid the spell-corrector trying to convert "Jessie" into "Jesse." This is a great search strategy to know: Use newpaper archives, but know how to find the archives in the first place! Wanting to check out everything, I also went to Google Patent search and, armed with the full name “James W. Paige” and knowing he invented a kind of typesetter, I was able to find his original patent, US 547859, "Machine for setting, distributing and justifying type." James Paige took a good deal of Twain’s money and then more-or-less wasted it, losing his investment. Somewhat later, Paige took an interest in actress Jessie Hall (stage name: Dorothea Lewis) and convinced her to move in with him in Hartford, CT. Apparently all was not well in Hartford as she later had him charged with assault and battery of her (and her mother). Then, the way these things go, one week later, Paige and Hall left Hartford for Chicago. (!) More disagreements followed and Hall returned to Hartford and filed suit for $800,000 for promising to marry, but then backing out of the deal. Just to add a twist, when the case came to trial, it turned out that Jessie Hall had JUST been to that same court for illegally living with another man, Edwin M. Grant. In the end, the lawsuit against James W. Paige (Case #S-140309) was filed in the Superior Court of Cook County, Illinois. On February 17, 1893, both the attorneys for Paige and Hall signed a document dismissing the case without cost. But it’s a $9 minimum + $2.00 for the first page and 50 cents per page after that. 1. Newspaper archives are a wonderful resource for tracking down complex stories, but they're scattered all over, and over are not indexed by Google, so you need to actually use their web sites to search their archives. 2. Newspapers often charge for access. Luckily, if you shop around, you can often find less expensive versions of the content. Lots of people got this challenge correct, which is great. Interestingly, it seems to have taken somewhere between 2.5 minutes and 20 minutes! I know that most people consider 10 minutes to be a fairly long task (most search tasks take less time). But did you find this difficult? Is search task difficulty the result of just the amount of time you take, or of the number of searches and clicks you have to do to get to the answer? What's your opinion? Did you know.. Weather in Google Maps? Answer: Antarctic Islands and India?